The Giftmark .upholstered rocking chair with ottoman is just the right size for children to rest after a long day of school or play. 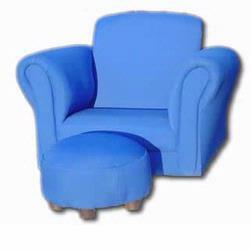 The chair and ottoman have a wooden base and the fabric is a milky soft fabric designed to withstand many years of play and fun. The fabric is easily cleaned with a mild soap and water. The Giftmark 6715 rocking chair and ottoman are extremely inviting with their thick, padded cushions that are so soft -- your child will slip right into the chair and will never want to sit anywhere else.